Anyone in the market for a digital piano should check out the DP10 - it's got excellent sounds and touch and is a real bargain. Excellent keyboard action, straightforward and simple, great price. Speaker positioning is not ideal, keyboard split-point for layered sounds can't be adjusted, no standard MIDI-out socket. 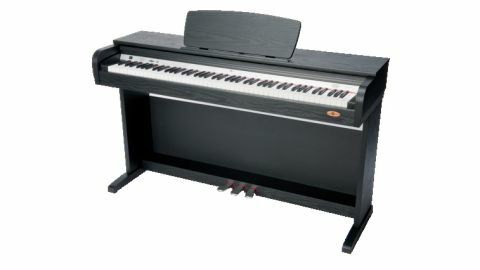 The DP10 is a digital piano with a standard 88-note hammer-action keyboard, a selection of different sounds, built-in speakers, and an attractive integrated stand. The base of the stand incorporates three piano-style pedals. An unobtrusive panel at the rear provides connectors for power and audio I/O, as well as a USB socket for hooking up the DP10 to a computer. Two headphone jacks are also provided on the underside of the piano. Once assembled, the DP10 is not an unattractive beast. The black stain-effect wood finish and clean lines may be somewhat neutral, but they will blend in anywhere. The DP10 has a slide-over lid that tucks back into the body of the instrument to reveal the keyboard... And what a keyboard it is. The weighting and 'bounce' of the keys is exactly what we'd expect from an acoustic piano, and is as good as anything we've seen on digital pianos costing three times as much as this one. The touch sensitivity of the keys can be adjusted to suit your playing style, but we found the out-of-the-box setting to be perfect. The three brass-finish piano pedals are positioned much as they would be on an acoustic instrument, and have a solid feel and positive spring-back action. They provide the conventional sustain, sostenuto and soft effects. The DP10's built-in sound system gives a clean and undistorted sound and can kick out as much sound as you would realistically need. However, the main speakers are mounted on the underside of the piano facing downwards. When placed on a carpeted floor, this reduces the clarity of the sound. On the plus side, though, the stereo imaging is very effective and the sound seems as wide as the piano itself. The speaker system can be disabled by plugging some cans into the second of the two headphone sockets. This is perfect when you want to practise in private or tinkle the ivories without disturbing anyone. The other headphone socket does not disable the speaker system. This comes in handy if you are playing in a group or ensemble and want to be able to hear your own sound clearly above that of your fellow musicians. The DP10 comes loaded with a small palette of sounds. There are two piano sounds (one bright, one warm), then there's CP80-style electric piano, harpsichord, vibraphone, church organ, strings, trumpet, sax and oboe. The two piano sounds are reasonably good; they're not going to challenge a top-end physical modeling synthesis engine, but are very playable nonetheless. The other sounds are a mixed bunch. None are bad and all give a decent emulation of the source sound, but none leap out as being particularly great. It's possible to load two sounds at once as a layered pair or, by using the 'strings (lower)' preset, you can create a split with strings under your left hand and whatever you like under your right hand. The split point is fixed at F#3. It's a shame this can't be adjusted. The DP10 also features a reverb unit and chorus effect. There are four different presets for each, with no further control possible. While some may find this a bit limiting, we found the presets to be well judged, offering a useful spread of possibilities. The addition of more fine tuning controls would only add unnecessary complexity to the impressively straightforward DP10. Another handy feature is the built-in metronome, which emulates the sound of a classic clockwork metronome, complete with bell ring on the first beat of each bar. Gear4Music has kept things simple on the features front: this piano isn't trying to act as your backing band or your recording studio. The DP10 is all about the pleasure of playing the piano. The control panel that runs across the rear of the keyboard is delightfully uncluttered. There's a power switch at the far left, to the right of which is a volume slider followed by a single function button. And that's it. The function button works in conjunction with the keyboard: hold down the button and press a key to select a different sound, change effects presets or enable the built-in metronome. The control panel clearly labels each key that can be used in this way. It's a straightforward procedure and should be a doddle for even the most technophobic of users. If you want to record the sound from the DP10, or feed it into a separate speaker or PA system, then the aux-out connector on the rear panel will do the trick. Surprisingly, there's also an aux-in connector, which enables you to mix an external signal with the DP10's sound - perfect for when you want to play along with CDs or backing tracks. Alongside these audio connectors is a USB port. This enables you to send MIDI messages from the DP10 to your computer and vice-versa and means you could use the DP10 as a master keyboard in a studio. We'd like to have seen old-school MIDI ports as well as - or instead of - a USB port. MIDI ports are ubiquitous and would have enabled the DP10 to control other keyboards and synthesizers. There are better sounding digital pianos out there, but at three or more times the price of the DP10. Ultimately, the most important thing in any instrument is playability, and in this regard the DP10 performs very well indeed. As an entry-to-intermediate level instrument, it will not disappoint.